Although most documents can now be accessed digitally, paper organization can still be a challenge in households. Mail and papers from work and school can easily become overwhelming. Setting up an organized system to manage household paperwork can be beneficial. 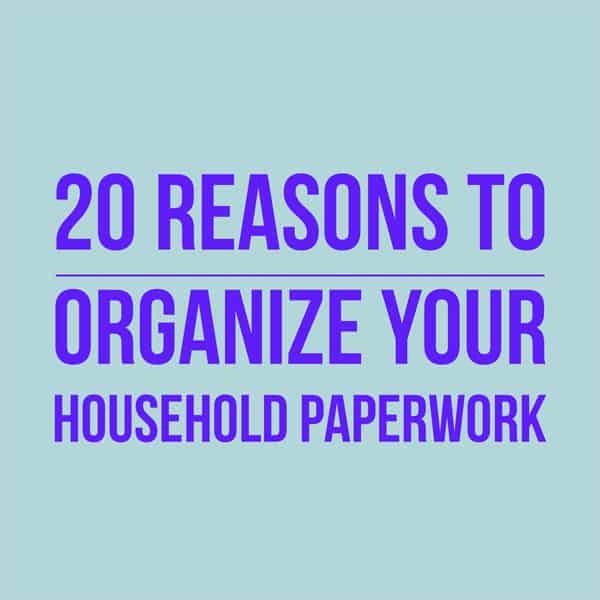 Here’s a look at 20 reasons to organize your household paperwork. 1. To easily locate important records and information when needed. 2. To eliminate overwhelming paper piles. 3. To make sure all mail is read and processed. 4. To have the details of upcoming events received by paper invitation. 5. To avoid late fees by having bills organized and paid on time. 6. To quickly be able to provide vital information if there is an emergency. 7. To make it easier to file your tax returns. 8. To keep better track of financial records. 9. To keep track of receipts. 10. To have insurance information ready if needed. 11. To update your schedule based on school, church and activity calendars. 12. To gather essential documents (birth certificates, social security cards, etc.) to move to a safe deposit box. 13. To provide information such as your will, health care directives and passwords to financial accounts to family members in case of your hospitalization or death. 14. To have easy access to user manuals should something in your home need repair. 15. To keep track of coupons, rebates and sales flyers. 16. To keep better track of your child’s school activities, making sure permission slips are signed. 17. To retain immunization records and other frequently needed information for childcare centers, schools and camp forms. 18. To have an accurate health history on file for all family members. 19. To prepare papers for scanning. 20. To be able to retain necessary documents in an organized filing system. The main benefit of organizing any area of your home is that you and your family will save time searching for items resulting in less stress and chaos. If you live in the Raleigh, North Carolina area and need hands-on organizing assistance or want a do-it-yourself plan, I’d love to help you. If you live elsewhere, I offer virtual organizing services via FaceTime and Skype to help you with any size organizing project. Please contact me for a free phone consultation to get started. Although we are moving more and more toward a paperless society, there definitely are still some papers we need to have. I love all of these reasons. My Mom has a complicated health chart, and keeping her paper records of all of her various procedures, doctors and medications is so helpful. Thanks for commenting Seana. Yes, there are definitely some papers we still need to have. I’m sure that keeping the paper medical records for your mother has been very beneficial to your mother’s overall healthcare. I’ve noticed that the younger generations tend to have less (or almost no) paper. People over 50 (even 40) still retain a lot of paper. Guilty as charged. Getting those papers organized is essential for all of the excellent twenty reasons you named. As my parent’s health began to deteriorate, I stepped in to help. My Dad had always been the keeper and handler of the critical papers. Together we organized all of the vital documents into one box. It was so helpful to do that, and it made taking over the daily management of things so much easier knowing where everything was. I could instantly find documents like wills, cemetery plots, insurance policies, etc. Thanks for commenting, Linda. I am glad you were able to organize your dad’s vital documents together. I’m sure it made things so much easier for you. I do find that I have fewer and fewer papers these days, I still prefer to have the important ones in paper form. Papers like policies for insurance, wills, and other “important documents” need to be stored in a fireproof box or safe deposit box, not in a regular filing cabinet. It’s better to be safe than sorry. Yes, those important documents definitely should be stored in a fireproof box or safe deposit box. Thanks for the comment! I think #6 on your list is the most important. Being able to find needed information quickly. Thanks for the list. Yes, I think that is most important, too. Thanks for commenting. I used to go through my files every year, but now that so many of our documents are in digital format, it isn’t as pressing to make room for new ones, so this task has been neglected. While reading your post (#19 specifically), I was inspired to not only get rid of what I no longer need, but to scan those I do need, retaining the originals only when it makes sense to do so, such as legal documents. I might even be able to get rid of my heavy old file cabinet! I find that with so many digital documents, many people only need one or two file drawers or boxes to retain important documents. If they are able to scan the rest, it really saves space!